All new for 2018, the Kia Stinger is a sport sedan with a secret – a hatchback and plenty of room for passengers. 2018 Kia Stinger GT2 AWD V6: A lot to buzz about? Conventional wisdom: Car and Driver likes the "serious straight-line speed, concept-car design, incredible value" but not that the "at-the-limit handling can be iffy, won't inspire badge envy, interior is not quite luxurious." Marketer's pitch: "The new paradigm of gran turismo, delivering high performance and supreme comfort on the open road; not for the fainthearted." Reality: That pitch is a stinger. But the car's not bad. 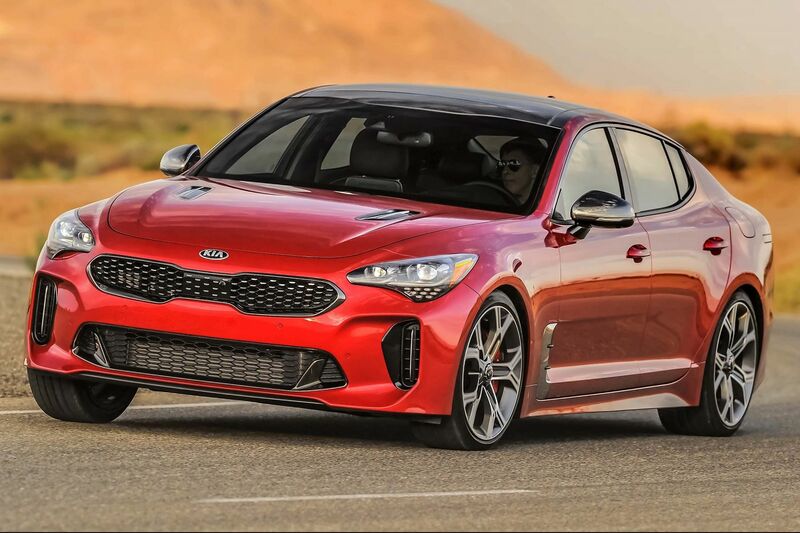 What's new: The Stinger is Kia's all-new entry into performance sedans, but it begets its own vehicle classification — the four-door performance hatchback. Hatchbacks have long been anathema to the American market, but their versatility makes them second only to the station wagon in Mr. Driver's Seat's heart. I've been wanting to try this car forever and was sorry to get it so late in the game that it already had 10,000 miles on it. Mr. Driver's Seat gets no respect. Step inside: I expected to find the Stinger made up of standard Kia interior pieces — thinking I might feel as if I were in the K900 or the Optima. But the triple round blowers in the center of the dash say "sports car," and high-end buttons and knobs more than make up for the standard-issue Kia typeface on all the gauges. Up to speed: The Stinger uses a 3.3-liter twin-turbo V-6 that creates 365 horsepower. It moves the vehicle to 60 mph in 4.4 seconds, according to Car and Driver. Yikes. On the curves: The low-slung Stinger comes with 19-inch summer tires and electronically controlled suspension that combine to make the vehicle feel like an exotic car on the curves. The long hood only adds to the feeling. The handling isn't BMW worthy, but it's pretty darn close. Still, while the Stinger's Sport mode (one of five settings) really turns the car into a rocket, it almost feels a little out of control. Shifty: Here's another minor downfall in the Stinger. The eight-speed transmission feels quite balky at low speeds when cold; a first spin around my neighborhood felt rather lurchy. But this dissipated quickly after heading out on the open road. The electronic shift lever with a Park button is much easier to handle than many upscale cars; push up for Reverse and pull for Drive. Unfortunately, shifting is handled through steering wheel paddles only, but the Stinger has a nice way of changing back to automatic that I found pleasant, and the computer added just the right amount of downshift help as well. Kia did not just paste together its usual dashboard for the 2018 Stinger; its individuality should be a strong selling point. Driver's Seat: The Stinger offers great comfort for a sport sedan way down there close to the ground; the giant center console reminded me of a Corvette or Mustang. Heating and cooling controls for the seat come via a sweet pair of toggles right there on the console. Very retro. Friends and stuff: Rear-seat occupants will not feel forgotten either. Leggy Sturgis Kid 4.0 found room for his lower half sufficient; headroom was a little more difficult. We packed the backseat with three people more than a few times and got no complaints, but Sturgis Kid 1.0 must have been in a good mood — the hump and console make the middle seat the real Stinger here. Perhaps Sturgis Boyfriend 1.0 helped make the ride more enjoyable. And despite the sporty look and feel, there's room to haul a little more in back as well. Cargo space totaling 23.3 cubic feet behind the rear seat and 40.9 with the seat folded — with full hatchback access — should be a bonus. Play some tunes: The infotainment controls feature plenty of old-style buttons for switching through music sources and navigation modes, and they look classy in silver. Dials control volume and tuning. Elegant and classic, what more could one ask for? Sound is a B+. It's better than most Kias but still not the best I've ever heard — bass heavy and not clear. Look out behind! Like most in this category, the rear window is angled hard and difficult to see through. I also had a tough time making the rearview mirror see where I needed it. Night shift: The headlights sit a tad low as in many sporty cars. Interior lights glow with even more subtlety than most upscale Kias. Fuel economy: I averaged about 20 mpg in a hot-rod assault on Chester County's roads. Feeding the Stinger premium is recommended. Where it's built: Sohari, South Korea. How it's built: Consumer Reports gives the Stinger a 3 out of 5 for predicted reliability. In the end: I fell in love on looks alone, and the test drive only confirmed my feelings.